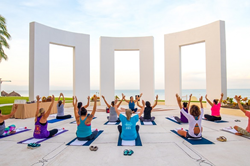 Grand Velas Riviera Nayarit announces its 2019 Wellness Getaway inclusive of industry leaders, crystal readings, yoga, and other mindful wellness activities will be held May 9-11. Grand Velas Riviera Nayarit announces its 2019 Wellness Getaway inclusive of industry leaders, crystal readings, yoga, and other mindful wellness activities will be held May 9-11. All special Wellness Week activities are included complimentary in the resort’s nightly rate. Colleen McCann is a certified Shamanic Energy Practitioner who was a fashion stylist in a past life. She has travelled the world researching crystal traditions and conducting crystal readings, as well as space clearing and balancing, shamanic healing, and intuitive business coaching sessions. Her work has been featured on GOOP, and in The New York Times, Vogue, Vanity Fair, Refinery29. She lives in New York and Los Angeles. Her website is http://www.stylerituals.com.